'One of the best love stories I've ever read.' Angie Thomas, bestselling author of The Hate U Give. 'Read this one, reread it, and then hug it to your chest.' 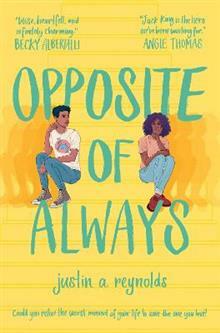 Becky Albertalli, bestselling author of Simon vs. the Homo Sapiens Agenda From debut author justin a. reynolds comes The Opposite of Always, a razor-sharp, hilarious and heartfelt novel about the choices we make, the people we choose and the moments that make life worth reliving. Perfect for fans of Nicola Yoon and John Green. When Jack and Kate meet at a party, he knows he's falling-hard. Soon she's meeting his best friends and Kate wins them over as easily as she did Jack. But then Kate dies. And their story should end there. Yet Kate's death sends Jack back to the beginning, the moment they first meet, and Kate's there again. Healthy, happy, and charming as ever. Jack isn't sure if he's losing his mind. Still, if he has a chance to prevent Kate's death, he'll take it. Even if that means believing in time travel. However, Jack will learn that his actions are not without consequences. And when one choice turns deadly for someone else close to him, he has to figure out what he's willing to do to save the people he loves. justin. a. reynolds has been a pest control operator, night security guard, steel mill janitor, NASA intern, salesman of high-end faucet fixtures, and carpet-flooring installer. He was most recently a registered nurse, before trading his stethoscope for a pencil, but likes to think both instruments reveal the heart. He lives with his family in northeast Ohio, home to snow, Lake Erie, and the Cavaliers. The Opposite of Always is his first novel.